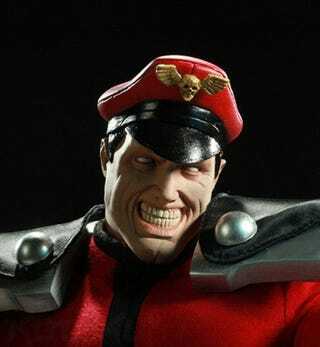 This statue is 19 inches of M. Bison, complete with billowing cape and enormous feet. And gums. Designed by Pop Culture Shock Collectibles, he's now available for preorder, and will ship to stores sometime in the Summer. There'll be 700 made available - 500 in red, and 200 in the Sideshow-exclusive black - and all will come with interchangeable hands, so you can rock standard hands or, if you're feeling flashy, blue lightning hands. So far, so good! Thing is, it also costs $345. I know it's 19 inches tall, but $345 is...yeah.